The Republic of Biafra was founded in 1967, the result of ethnic and economic conflicts among the people of Nigeria. After three years of war, during which the Nigerian government attempted to take back the fledgling state, Biafra, with its flag depicting half of a yellow sun, was no more. But its memory lives on in this novel by Chimamanda Ngozi Adichie. One of the characters in the book notes that “the world was silent when we died,” and indeed I had never heard of Biafra before reading this book. The republic began and ended before I was born, but even if I’d been alive, I wonder what I would have known about it. African wars do make the news in the U.S., but often only in the margins. The beauty of this book is that it requires no background knowledge about Biafra or Nigeria, but it avoids feeling like a primer on the war for ignorant Westerners. Adichie focuses on the human stories, showing how the politics of the time and the war itself touched these particular lives. The chapters alternate between three central characters, whose stories are told in third person. Ugwu is a houseboy, born in poverty and proud to be working for Odenigbo, a university professor who encourages Ugwu to study invites interesting people to his home to discuss politics and revolution. Olanna, born to a wealthy family, also teaches at the university, a job she took partly so she could be close to Odenigbo. Richard, an English writer, is a frequent guest at the Odenigbo’s house who falls in love with Olanna’s sister, Kainene. Through these three characters, all from different walks of life, Adichie gives readers a multifaceted view of the war. Not all suffer equally, but the war so consumes their lives that all do suffer. Adichie deftly moves between characters in a way that kept me always wanting to read more. I never felt disappointed to leave a particular character because I knew I’d be picking up the thread involving another compelling character. That’s rare in novels structured like this one! Often, there’s at least one weak thread, but not so here. There’s also a bit of bouncing around in time that was perhaps unnecessary but raised enough questions about the characters’ paths that it made me want to read on. This is the first novel by Adichie that I’ve read. I picked it up because I was planning to see her speak at Politics and Prose tonight, and I wanted to have read something of hers beforehand. Unfortunately, I won’t be able to attend the event, but I’m glad that my plans pushed me to finally read one of her books. I’m sure I’ll be reading more. Jenny read this almost exactly one year ago, so do check out her review. Ana recently did get to see her speak, and her post is one of the reasons I was so eager to see her myself. At least with each others’ blogs, we do get to have a taste of the many events we can’t attend. And of course, we get the push we need to try authors we might not have gotten to otherwise. A super review, as always. We read this book in our book group around a year and a half ago, but I remember it provoked one of the longest discussions we have had. It was a profoundly affecting book with some wonderful strong characters (particularly Kainene and Ugwu), and it brought back all the images from my childhood in the 60s of starving Biafran babies. This would make a good book group choice. Besides the historical angle, the characters offered so much fodder for discussion. This is beautiful review, Teresa. I like how you analyzed the themes of the book and you got them spot on. I read Half of a Yellow Sun and found it so profound. As an an African, this book opened my eyes to Biafra and what it means even today to the people and history of Nigeria. I’m sure you would love to read her first novel Purple Hibiscus. Her latest book is out, Americana, and I’m dying to lay my hands on a copy. Her compilation of short stories, This Thing Around Your neck is also a compelling read. I’m definitely going to read more of her books. I would have gotten her new book if I’d gone to the event last night. It sounds great and so different from this. I loved this book, so I really enjoyed reading your thoughtful review. And I agree that you should try Purple Hibiscus next, it’s another great read. I will certainly look for Purple Hibiscus–I’m pretty sure my library has it. Great review! I read this a couple of years ago – it is quite harrowing in parts, but so well written, like you I hadn’t heard of Biafra before reading the novel, I learned so much. It’s wonderful how literature lets us encounter stories we never knew. I read this book when it first came out and it knocked me backwards. Unlike you I am old enough to remember the Biafran War and my shame was that I had completely forgotten about it. How could I have forgotten the terrible pictures that filled our screens night after night? How could I have forgotten the shame of my country’s involvement? If I was ever in the invidious position of having to choose just half a dozen books to keep with me for the rest of my life this is one that would have to come under very serious consideration. I looked up some videos on YouTube last night, and the images were harrowing. It made me think about how slow we were to respond to the violence in Rwanda. So much pain all around the world and yet we don’t know or don’t respond (or don’t know how best to respond). Rwanda was dreadful. I worked with someone whose own family had got away but whose wife’s family had been completely wiped out. How they got through each day is beyond me. Too bad you couldn’t make the event, but is Adichie just wonderful?! I was born after Biafra too and had no idea such a war existed until reading this, despite being almost done w an international relations major in college when I picked it up. Oddly, I don’t think we even talked about it in my Politics of West Africa class, which had a professor from Cote d’Ivoire! That is interesting–and makes me feel a little less bad about knowing nothing about it! Based on other comments here, it does sound like it made headlines at the time. And yes, Adichie is wonderful. A friend who went to the event said she was extremely charismatic in person. I was a child, living in England, at the time of the Biafran war. What I remember about Biafra was that it was a byword for “famine” at the time; much as Somalia and Ethiopia came to be a couple of decades later. Some may remember Jello Biafra, lead singer of the seminal San Francisco punk band, The Dead Kennedys. Sadly, when I see the name Biafra, that is the first thing I think of. Perhaps this book will change that. Count me as a big fan of this book. Biafra was all over the news in the U.S. at the time, though much of the coverage did relate to the famine the war produced. I have Americanah on order at the local book shop right now. I should be starting it by the end of next week. I gave The Think Around Your Neck the old college try, but didn’t make it through. That said, Adichie is a writer I’ll be keeping an eye on. I think she’s terrific. I was talking with a co-worker yesterday, and she too remembered Biafra as soon as I mentioned it. It was just a speck before my time. Based on the other comments here, it sounds like Purple Hibiscus is worth a try too. My friend and I are reading Americanah together soon, and I’m very excited about it. I read Adichie’s first novel and enjoyed it a lot, and I have sort of been saving her other books. 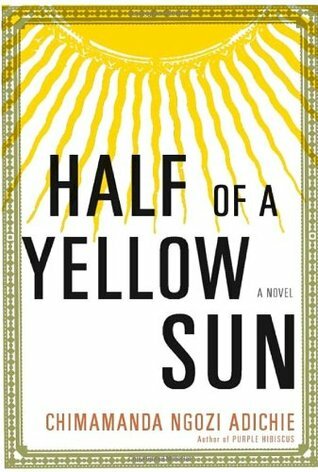 My work book club is considering Half of a Yellow Sun for our next book club read. It might end up with me bingeing on her other two existing novels, and then I will be so forlorn waiting for the next one. I know so many people who like to save a book so there’s always another one, just like you. I never think about that–if I like an author I want to read it all, because if I die tomorrow I might have missed out. Not that I ever seem to get around to reading everything by a favorite author, but that’s more a matter of too many books than a desire to wait. “This is an important book partly because it puts paid to any notion that Africans are somehow “other.”” Thank you for saying that, Theresa, because I think that’s an important point. I’ve recommended this book to several people; they’ve all mentioned varying degrees of surprise at how similar Olanna and Odenigbo’s lives were to theirs. I remember collecting money for Biafran famine relief when I was 10 or 11 – it was very much in the news at the time. And yes, not much remember now. Adichie has a new novel coming out this month, I think. I’m looking forward to reading it. It’s sad that it would be a surprise, but it’s true. We so rarely see stories of everyday family life and relationships in Africa. The continent only seems to get noticed here when there’s a war or a famine or something. But that’s not the whole story. The relationship between the sisters also struck me as familiar–just like so many other sisterly relationships I’ve encountered in literature or in life. One thing I’ve noticed is that whatever attention events like this get just isn’t sustained–it doesn’t seep into people’s consciousness. I see lots of people with personal passions regarding problems in different areas, but the only time I can think of there being lots of people rallying around is when there’s a natural disaster or when there’s a personal connection with the area.